Do you ever take planned getaways with your husband? Getaways can be hard, when you have kids, but it can also be great for your marriage. I truly believe that getting away alone once in awhile can help your marriage be more successful. With the stresses of everyday life, it can be hard to carve out time to spend together. Oh sure, we have good intentions. But then there’s dinner to be cooked, homework to be helped with, a house to be cleaned, and kids to be played with and tucked into bed. By the time everything is done, we’re usually too tired to think about anything else, except maybe sleep! That’s why taking time to plan out and then go on an adventure with your husband is so important. You need time to be just the two of you, with nothing else to focus on but each other. So how can a planned getaway help your marriage improve? You’ll work together in planning your trip. This is half the fun and can be downright exciting! My husband and I recently had a lunch date where we planned out our goals for the upcoming year. Just talking about what we want to see happen and how we plan on working towards our goals was inspiring. It was great to see us both on the same page and excited about our future. Need inspiration? Check out these ideas for date night. As I mentioned above, between work, household duties and family, it can be difficult (if not impossible) to focus on each other. Taking a trip together, even if it’s just for the day, means that you have your partner’s undivided attention (and he has yours!). Imagine, being able to sit down at a restaurant and have an adult conversation that doesn’t exist solely in your dreams! It is possible! Spending time reconnecting with your partner is so important, it’s vital for a marriage to succeed. Let’s face it, someday the kids will be grown and move away (although hopefully not too far!). 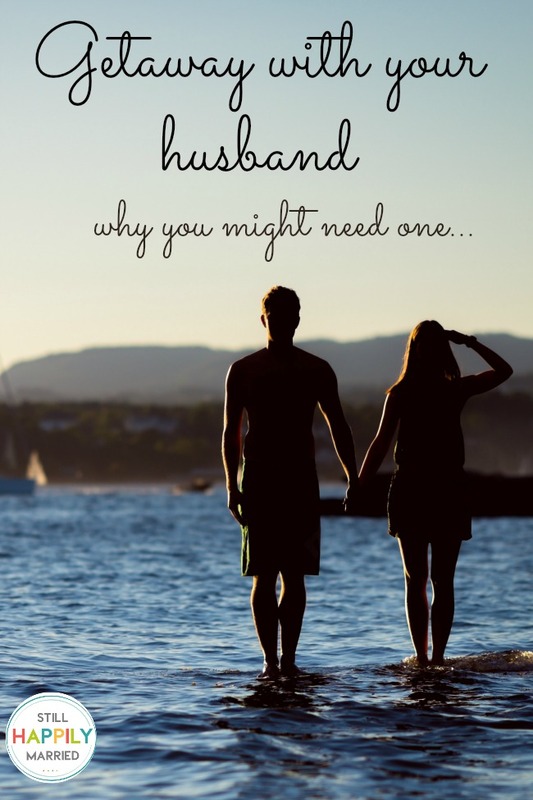 You need to nurture the relationship you have with your husband, because he’ll be the one still there every day. It’s so easy in this life to lose yourself. I’m a woman and a wife, yes, but most of the time both of those take the back seat to my #1 title, and that’s mom. It’s likely the same way for your husband (aka Dad). Getting away from those precious kiddos of yours will give you time to be yourselves again. You can focus on being a woman and a wife, and enjoy it. That doesn’t mean we love our kids any less just because we need some time to be us. But what if we can’t afford a getaway? A planned getaway doesn’t even have to be an overnight event, just a few hours away. It can be dinner and a movie, or taking a walk and window shopping. What you do is totally up to you. Can you afford NOT TO get away and take time for your marriage? My husband and I have decided that we need to be a priority. And while we can’t necessarily do this on a monthly basis, we have set a goal to plan a getaway every three months. So four times this year, I’ll be hanging out with my man, enjoying his company and having fun. We might even try an overnight stay a few times (close to home of course…thank goodness we live near the beach, yay!). What’s your take on the subject, do you think planned getaways can help your marriage be successful? We’d love to hear your opinion in the comments!